Making the most of your gray, silver, or white hair is much easier if you use the right product. In our extinsive research we found Jhirmack Silver Plus works best for gray hair. what are the Best Shampoo for Gray Hair? Who needs special shampoo for gray hair? There was a time when many people connected gray hair to the word ‘old’, even though there is plenty of folks who turn gray at a younger age. Thankfully, those days of feeling the need to dye hair when it goes gray are gone and many folks are now embracing their gray, silver or white hair, so much so, that some younger people are even dying their hair grey to look trendy. With today’s modern styling, gray hair (or salt and pepper hair) can now look incredibly chic and classy, so if you’re still fighting against the tide this could be a good time to take the plunge and accept that your natural color is attractive, whether you’re a woman or a man. Silver Plus Ageless Shampoo covered the whole extent of what we’re looking for in a shampoo for gray hair. This has been made easier than ever before because some hair care product manufacturers have engaged with consumer demand to produce ranges of shampoos and conditioners that are designed specifically for those with gray hair. These will help you to enhance your natural hair color and keep it looking well maintained, so with this in mind we’re taking a look at the best shampoo for gray hair in our ultimate guide. As well as product reviews, we’ll also be delving into why hair goes gray in the first place, who needs shampoo for gray hair, and tips for looking after it, so check out the guidance below to enhance your natural color. It’s a common misrepresentation that hair ‘turns’ gray but that’s not actually the case. Put simply, hair is white to begin with and obtains its color from cells in hair follicles known as melanocytes. The amount of melanin along with the type (eumalanin produces darker colors while phaeomelanin produces lighter colors) and the way it’s distributed then decides our natural hair color. Over time the production of melanin in our hair follicles reduces, so the hair simply loses pigmentation and is then white. This usually happens to older people but in fact can happen at any age, and genetic factors mean we’ll often start losing pigmentation at around the same time as our parents. When hairs that have lost pigment appear alongside hairs that are still pigmented, the overall effect is then one of gray hair. As more pigmented hair is lost the hair can then look silver or completely white. Losing the pigmentation of hair is a natural part of the ageing process, though for some people it can happen sooner than for others, and there can be also external factors. For example, some autoimmune conditions such as anemia or thyroid deficiencies can cause people to go gray earlier, while a major shock or chronic stress can also be the cause of premature graying for some people. This is an easy question to answer as it applies to anyone who has gray hair who wants to make the very best of it. Some people who are going gray may notice their hair feels coarser and loses its shine. Therefore, using the right shampoo can prevent gray hair looking dry, dull and brittle. Another problem with gray hair is that it can tend to take on a yellowish tinge, and you might especially notice this if you use swimming pools containing chlorine or have chlorine in your water. Shampoos produced for gray hair will often take that into account and correct it. These shampoos tend to be blue or purple colored and are not generally to be used every day although you can alternate them with a different shampoo. Improve your diet to provide good nutritional balance. In particular B vitamins such as B12 are important in keeping hair healthy and in good condition. Avoid smoking as this can affect the rate at which your hair goes gray. Protect your hair from the sun to avoid it drying out and becoming brittle. Avoid or cut down the use of heated styling devices such as hair straighteners or hairdryers if at all possible, for the same reason as above. Along with moisturizing shampoos and conditioners, using oil treatments can help to further replenish the moisture in your hair to keep it looking shiny and glossy. If your hair is still excessively dry, try an olive oil mask left on overnight. It’s commonly thought that shampooing your hair every day is the best approach, but it can better to only wash hair around 3 times a week to avoid stripping out the natural oils. If your gray hair has yellowish tones this could be because of chlorine and heavy metals in the water. It’s worth thinking about changing your shower head to one that can filter these out. Many salons offer deep conditioning treatments and these can revitalize gray hair. A scalp massage to increase circulation to the scalp and stimulate hair follicles is good for any kind of hair. Finally, once your gray hair is in great condition remember to have regular haircuts and styling to keep it in tip-top shape. Increasingly, shampoo manufacturers are becoming aware of the growing market demand for products for gray hair. There’s a big choice available and knowing which might be the best one for you is not easy. This is where we come in as we’ve tested many of the top-rated choices recommended by both professionals and consumers. We’ve considered various aspects of our testing and the following are all shampoos for gray hair that we think are worth spending money on. All of these prices on Amazon are correct at the time of writing but are subject to change. Also, note that some products are available in multi-packs that can work out cheaper. The reason we gave our highest award to the Silver Plus Ageless Shampoo is because it covered the whole extent of what we’re looking for in a shampoo for gray hair. 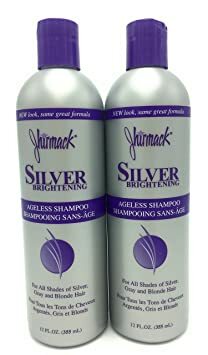 The Jhirmack Silver Hair Care regimen is suitable for all shades of gray and silver hair, and as well as shampoo the range also covers conditioners and styling products such as mousse and brightening leave-in spray treatment. The manufacturer’s instructions for using the shampoo are pretty much the norm, simply wet the hair, add shampoo and lather, leave for two minutes, then rinse and repeat again if desired. It’s worth pointing out that we found we only needed a small amount of the shampoo as it went a long way, so this made it reasonably priced. The reason we gave our highest award to the Silver Plus Ageless Shampoo is because it covered the whole extent of what we’re looking for in a shampoo for gray hair. It contains Folic Acid and Green Tea Extract to strengthen and condition the hair, as well as CoQ10 to protect hair from styling damage and keep it looking healthy. In our testing we also found our hair to be well moisturized due to the Macadamia Nut Oil content. In previous experiences, we’ve found shampoos with oils can tend to make hair look a little greasy but that was not the case with this one at all. As if all this wasn’t enough, we were thrilled to see that the shampoo really helped to tone down the yellow tints in gray hair, and it can also be used on bleached, highlighted, or blond hair. Overall, the Jhirmack Distinctions Silver Plus Ageless Shampoo made hair feel silky soft and look glossy and luxurious. We also looked at product reviews by other users, which were extremely favorable. Indeed, the shampoo receives a top rating of 5/5 stars on Amazon, and with our own testing in mind as well we have to highly recommend this as our best shampoo for gray hair. Brightening Shampoo, 6.7 fl. oz. The Phyto Phytargent Brightening Shampoo enhances natural highlights in the hair and we loved the radiant results it gave. It was a close run race between this shampoo and the Jhirmack one for top choice, but the higher price of this Phyto Phytargent Brightening Shampoo put it in second spot. It’s a great product though and the anti-oxidant rich formula left hair looking shiny, bright, and full of health. We noticed a difference in hair quality after just one use, and the shampoo is suitable for gray, white, and platinum blond hair. The shampoo contains cornflower extract to help hydrate, soften, and detangle the hair, and it neutralizes brassy tones and corrects discoloration thanks to a trio of color enhancing plant extracts, walnut leaf, broom, and rhatany root. It also enhances natural highlights in the hair and we loved the radiant results it gave. User reviews we looked at were generally glowing, although we noticed that a small number of users didn’t feel it was as effective. It has an affordable price tag and has been designed to neutralize and correct brassy and yellow tinges on both gray and blonde hair, and to add brightness to gray and white hair. If your focus is to remove the yellow tones from your gray hair then this gentle cleanser with a soft violet color is worth checking out. It has an affordable price tag and has been designed to neutralize and correct brassy and yellow tinges on both gray and blonde hair, and to add brightness to gray and white hair. This one really did remove dullness and liven up the hair, though it’s worth noting that you need to wear gloves when using this shampoo because of possible staining. It’s recommended that if you shampoo twice it’s a good idea to leave the lather on for 3 to 5 minutes before the second rinse. If you shampoo your hair every day we’d recommend using this only 2 or 3 times a week and alternating with a different shampoo for best results. We found that the rich, creamy lather provided good shine and left hair with plenty of body, though some users report it left their hair dryer than usual. The price tag of this shampoo might deter some buyers although given the size of the bottle it’s really not as expensive as it first seems.. The price tag of this shampoo might deter some buyers although given the size of the bottle it’s really not as expensive as it first seems. Aveda is known for high-performance plant based haircare products, and we couldn’t help noticing the beautiful luxurious smell of this shampoo that comes from pure flower and plant essences including ylang ylang, lemon, and eucalyptus. This made the purple shampoo a real treat to use and like many other shampoos made especially for gray hair, this one corrected yellow tones and added gorgeous silvery tones. Other users seem to agree as it has a high 4.5/5 star rating on Amazon. White & Gray Hair , 6.7 fl. oz. We loved the subtle herbal and flowery scent to this shampoo, but noticed from user reviews that not everyone enjoyed the smell of it as much as we did. Many people now look for products that are not so packed with chemicals and this is a good choice on that score. This shampoo is paraben-free, sls-free, silicone-free and free from synthetic colorants, and the product is made using innovative and efficient methods with plant-based ingredients. The gentle formula is good for hair fibers and helps to add volume while keeping it soft. It will make the best of gray or white hair and while many shampoos for gray hair are blue or purple to correct yellow tones, this one is more natural. Nevertheless, it still gives good results without stripping the hair dry. We loved the subtle herbal and flowery scent to this shampoo, but noticed from user reviews that not everyone enjoyed the smell of it as much as we did. We were surprised at just how silky the hair felt and the manufacturer claims that this shampoo can also refresh faded highlights. 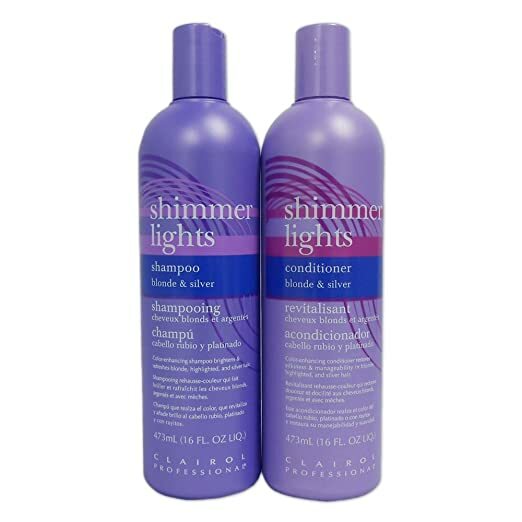 The price of this shampoo and conditioner set makes it a great value and the products themselves are definitely worth trying out. The shampoo can be used on natural or color-treated hair and we found that using the protein-rich color-enhancing shampoo and conditioner got rid of dullness in gray hair and removed residue without making it too dry. We were surprised at just how silky the hair felt and the manufacturer claims that this shampoo can also refresh faded highlights. The only drawback as far as we were concerned was the smell of the shampoo that had a strong chemical aroma. We noticed in user reviews that this was also something noticed by other users, but if you don’t mind the smell this is an excellent option. This shampoo has been infused with protein to strengthen hair, the hair was made smoother and easier to manage with a glossy silver shine, and it also had a very nice scent. We’re pretty sure that both women and men can use most shampoos for gray hair. However, the manufacturer of this one states that it’s designed particularly for men with gray or white hair and that it uses the very masculine sounding Steel Lock Technology! It will eliminate unwelcome tones thanks to the yellow neutralizer in the formula, and in our testing, this worked well with our male volunteer who really appreciated the difference it made. This shampoo has been infused with protein to strengthen hair, the hair was made smoother and easier to manage with a glossy silver shine, and it also had a very nice scent. If you are about to invest in a good shampoo for gray hair there are several factors to consider. For instance, you should take into account whether your main requirement is to have shiny, healthy-looking hair, whether you want to get rid of any unsightly yellow tones, or whether you want to eliminate dryness. Of course, another factor is the price of the different products, and to make it easy to compare this we’ve also provided the shampoo bottle sizes. We’d like to feel that our top pick, the Jhirmack Distinctions Silver Plus Ageless Shampoo, has all of these bases covered. We couldn’t fault the results and were amazed at just how much better our hair looked after using it. 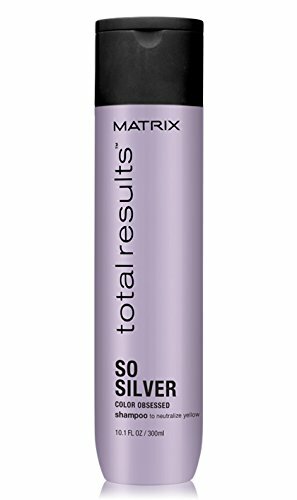 Meanwhile, if you want a budget-friendly choice the Matrix Total Results Color Obsessed So Silver Shampoo is a solid option, while if you want to spoil yourself with a touch of luxury it has to be the gloriously scented Aveda Blue Malva Color Shampoo. Our runner-up product, the Phyto Phytargent Brightening Shampoo really gave radiance to the hair, and in fact, we think that any of the best shampoo for gray hair products that we’ve detailed above has plenty to offer. We’re exceptionally glad that graying hair is now viewed positively and not as something to avoid at all costs! The truth is that gray, silver, or white hair can now look equally as attractive as fully pigmented hair thanks to the abundance of products available on the market especially for this kind of hair. No longer do we need to worry about gray hair being dry, brittle, coarse, or frizzy, as many gray hair shampoos can now replenish and restore hair to its previous condition. Your crowning glory can still be soft and glossy if you use the right product, and those annoying yellow or brassy tones can now be eliminated completely to result in a radiant head of hair that you can flaunt with pride. Among the products here there should be something for all tastes and requirements, and we hope that you will soon be full of pride with your newly restored and brightened hair.